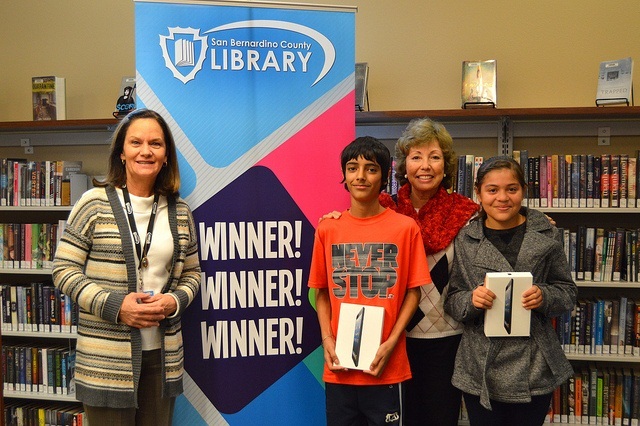 Two local students were awarded with iPad Minis on Wednesday from Supervisor Josie Gonzales as winners of the Baker’s Book Club, San Bernardino County Library’s first fall reading program. The prizes were presented to Citlaly Placencia, 12, of Muscoy, who read a total of 5,667 pages during the 49-day reading program, and Dilshad Singh, 14, of Muscoy, who read a total of 2,827 pages. From the 7,430 students who signed up for the book club, Placencia, a 7th grader at Chavez Middle School, and Singh, a freshman at Cajon High School, each read the most pages in their respective age categories. The iPad Minis were donated by Supervisor Gonzales in hopes of motivating students to read more books during the Baker’s Drive-Thru sponsored book club. “Today we celebrate two students who dedicated themselves to achievement through reading,” Supervisor Gonzales said during the award presentation. “This valuable partnership made possible by Baker’s Drive-Thru and the San Bernardino County Library aims to instill a love for reading in our young children. Giving students that passion to read gives them a key to academic success and personal achievement,” Supervisor Gonzales said. The program, which ran Oct. 6–Nov. 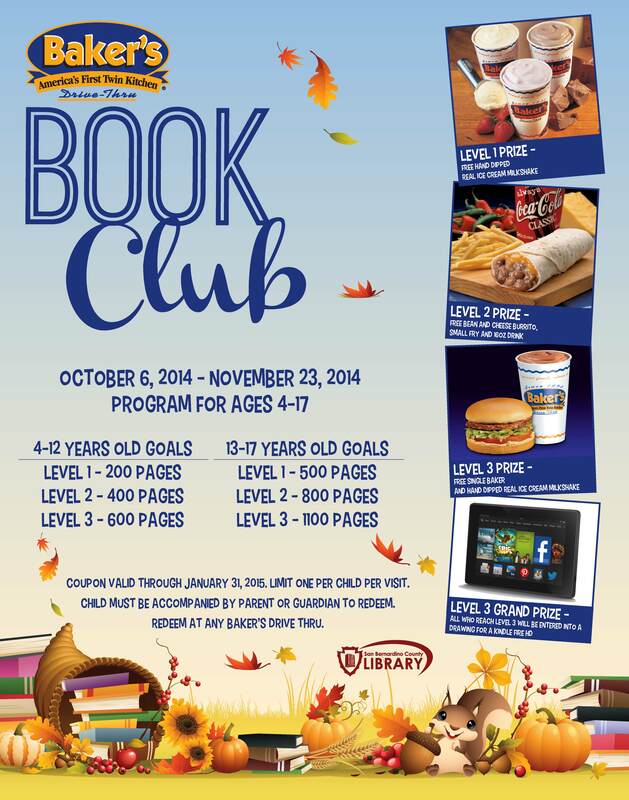 23 at all county libraries, is the first fall reading program of its kind in San Bernardino County. Children ages 4-17 were incentivized with prizes from Baker’s Drive-Thru ranging from free milkshakes and hamburgers to a grand prize drawing for a Kindle Fire. Parents were required to monitor their children’s reading progress and sign off on their page logs. For more information on the Baker’s Book Club, visit www.sbcounty.gov/library or call (909) 387-5720.